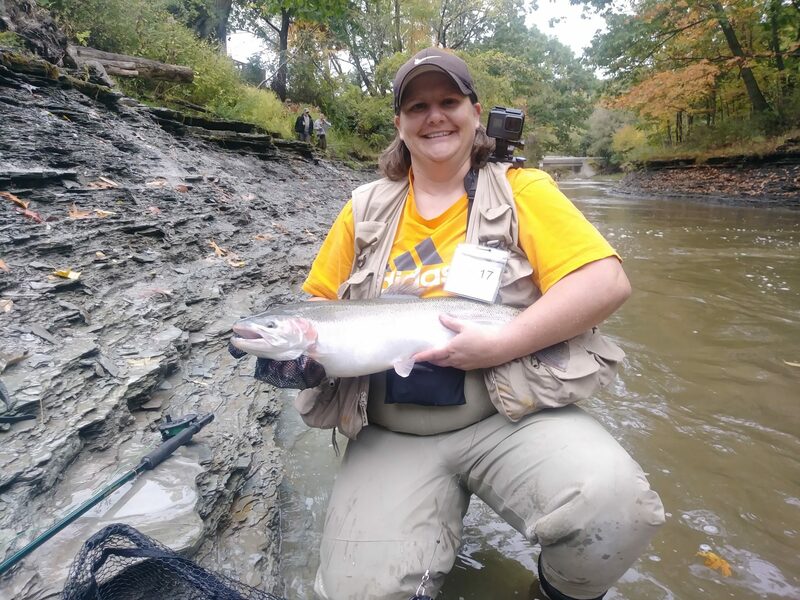 Wednesday 10-11-2017 – I had an interesting week last week as I finally decided that it was time to put the waders on and get out and try to catch some steelhead. I went on Wednesday up to Walnut Creek in Erie Pa to see what the creek was like above the bridge past the manchester hole. The fish are definitely in there and very active as they were moving up and down the rapids. The water conditions were low and clear with some leaves in the creek but I was able to catch one on a copper john fly and I let a little kid that was fishing next to me net it for me and he was so excited. I let him release it back into the water. It had rained previously so I thought the water would be up but it wasn’t right then. Wait, here it comes. All of the sudden this big wall of water came rushing down from the falls and the creek became muddy and full of leaves. You couldn’t even fish because everytime you threw out, the leaves would come in with you. I could also feel the water rising on my waders. Due to this sudden rise in water, stained water, and leaves everywhere, I decided it was time to head out. I guess I wasn’t the only one because 5 or 6 people were coming down from above the falls thinking the same thing as me. Thursday 10-12-2017 – I decided to head back up to Walnut Creek to see how the creek was doing after the rain we had previously. Boy, was I glad I did. I ended up staying most of the day catching steelhead on and off. I had a great time fishing and it seemed like everyone else did too. If you would look up and down the creek, you would see people catching fish. Fish were jumping all over whether they were hooked or not. A couple of times, there would be two fish jumping at the same time for no reason as they were not even hooked at all. 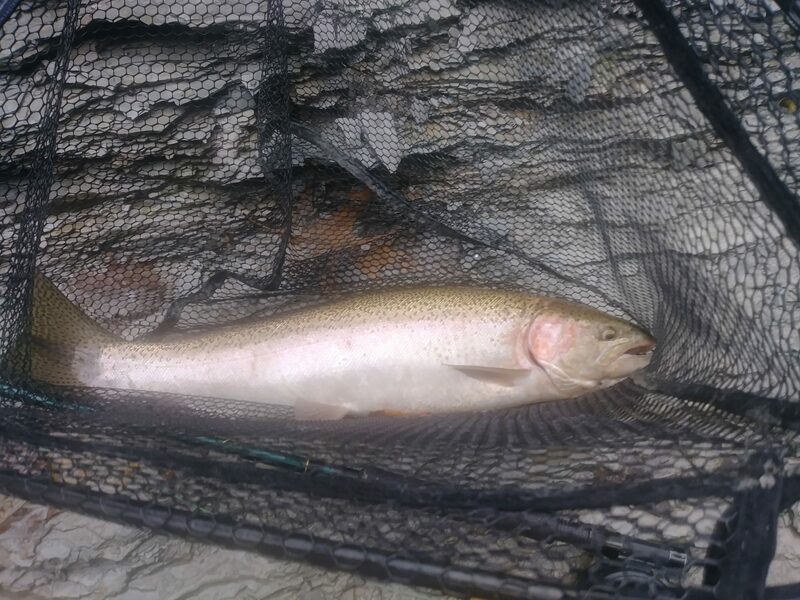 I did have a couple malfunctions with my camera which I was bummed about because I landed a nice steelhead that I didn’t even get on video but I did get a picture of it for proof that I did catch it! I did catch a bunch that day, I didn’t really count how many in total because I always just let them go. I have a few more pictures of the fish I landed that I will include here and you can check out the video I did manage to put together from that day. 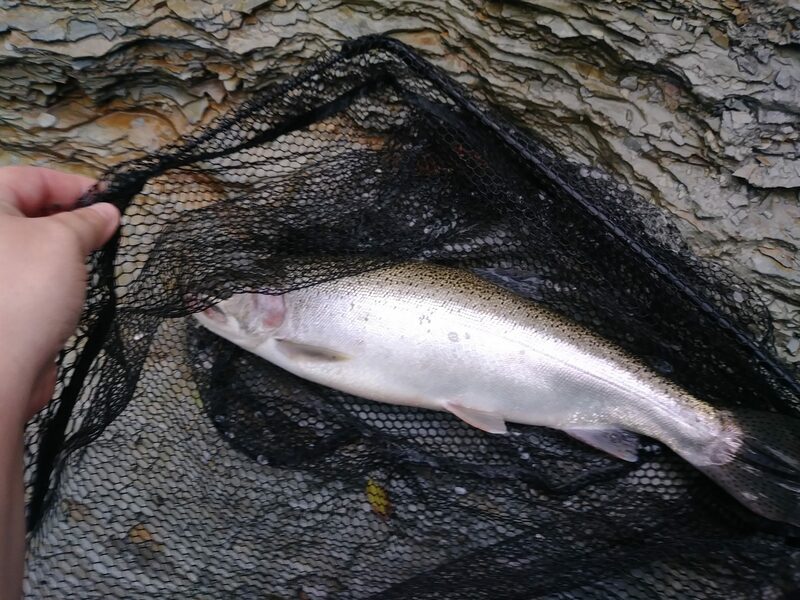 I was able to land another nice looking fish which I did manage to get on video but I couldn’t get a picture of it. If your wondering why, you will have to check out the video because, yes I got that on tape. Overall, it was a great day! Friday 10-13-2017 – After having a great day Thursday, I asked my nephew if he wanted to try steelhead fishing after school. He said yes and off we went up to walnut creek again to try our luck. Well, of course since he hasn’t caught a steelhead before he was in awe of the amount of fish in the creek and how come people were not catching them because they are just right there. He couldn’t get over how they were just sitting right there and not biting his hook. We did give it a good try but came up short of getting him his first steelhead. We will however, keep trying and I will take him fishing whenever I can. I also got to use my new fishing net and loved it!! Be sure to change your settings on the video to 1080p for better video quality! I was up at Walnut creek yesterday afternoon and shot some video of the creek conditions. For the most part, the rain we got the other day is gone and the creek is back down to low and clear. 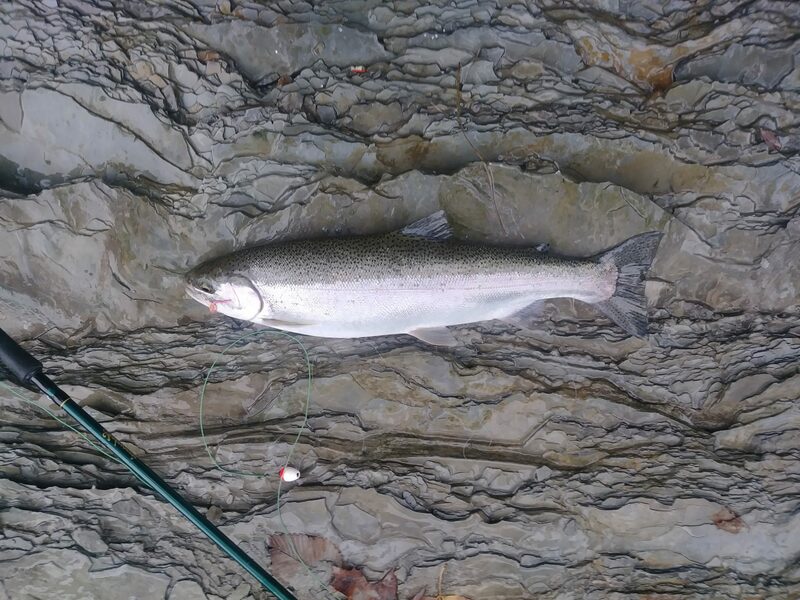 There were a ton of steelhead in the lower section before the stop sign hole. In the stop sign hole, there were hardly any fish as compared to my last video. There must have moved up and the other fish have not moved into that spot yet. 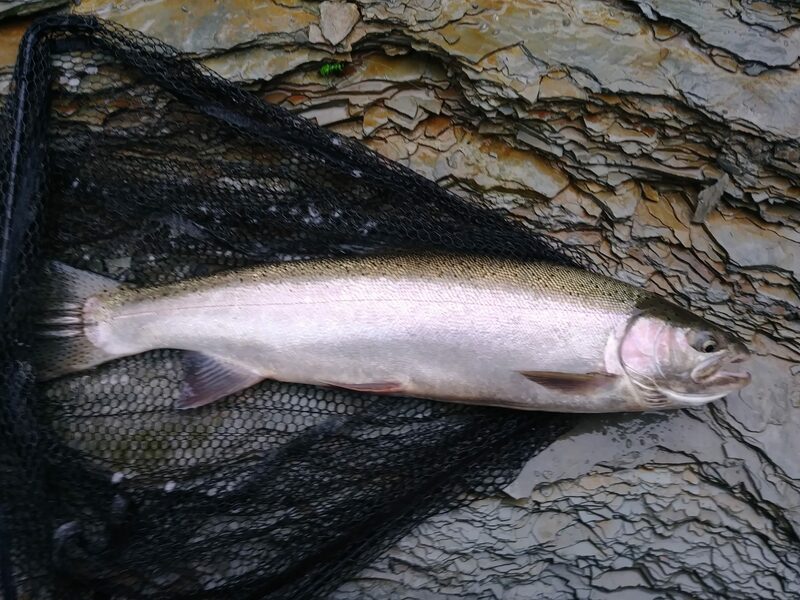 I did see a few people catching steelhead and several more with stringers so they are biting but again you are fighting the creek conditions. I didn’t film above the bridge but I can tell you that I did not see one person fishing the manchester hole, none. That tells me the fish have moved up from there and just like the stop sign hole, more fish need to move into that area which will only be possible if we get more rain. I don’t think I have ever seen the manchester hole so empty, especially at this time in the season. Typically, it is packed shoulder to shoulder with guys fishing but not this time. There are ton of fish in the creek but there are also a lot of people fishing the creek and only a few spots actually holding a decent amount of fish so everyone is in those locations. When you are fishing such low and clear conditions you should remember that the less you are in the water, the better. The fish are spooked and can see you, especially when it is clear so try to disturb them as little as possible. Using light line can help in these situations but will also make it harder to man handle the fish as it leads to more lines breaking off. They are calling for rain today 10-11-2017 but will it make a difference? Hard to say but anything will help. The problem is when we get the rain it only takes a day or so for the water levels to go back down and become low and clear again so you need to time your fishing days around the weather and rain forecast if possible. I also went down to trout run and there were a handful of people fishing in the lake. I saw one guy catch one and I also saw a stringer with 2 steelhead on it but it didn’t look like it was hot and heavy. Maybe it was because I was there in the afternoon? Hard to say. The lake was nice but I didn’t see the huge amounts of steelhead in the creek there as I have seen in the past so hopefully there are more to come from the lake.